Three-dimensional topological insulators (TIs), such as the prototypical compound Bi2Se3, form a class of materials that has attracted considerable and increasing attention in recent years because of their peculiar electronic structure : while they are insulating within the bulk, gapless surface states ensure surface conductivity. The growth of structures combining TIs and magnetically ordered materials is a prerequisite for the study of proximity effects at interfaces. 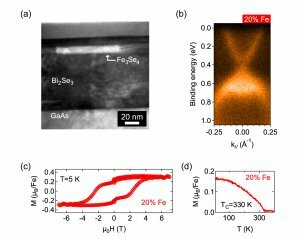 In such a context, researchers from the “Growth and properties of hybrid thin films” group have studied the growth by molecular beam epitaxy of nanocomposites combining the topological properties of Bi2Se3 and the hard magnetic properties of Fe3Se4. This work has been carried out in collaboration with groups in UFSCar (Brazil) and in synchrotrons Elettra (Italy) and Soleil. At the middle of the 2000s, theoretical calculations have predicted the existence of 3D topological insulators. Such compounds are insulating in the bulk and conducting at the surface. This is due to topological states linked to band inversion at the surface. These predictions have been followed by the experimental discovery of 3D TIs and this has triggered an important research effort on this novel class of materials with peculiar electronic properties. One of the most studied compounds is Bi2Se3. The growth of Bi2Se3 epitaxial thin films with state of the art structural quality by molecular beam epitaxy is mastered at INSP. In the last three years, studies conducted within the institute have evidenced that the electronic structure and the vibrational properties of Bi2Se3 depend critically on the thickness of the thin films [1,2,3]. One of the issue currently explored concerns the possible compatibility of 3D TIs with other materials in heterostructures, diluted compounds or nanocomposites (in the form of inclusions within the insulating matrix of a TI). In this context, coupling a TI with a magnetically ordered material or a superconducting material enables to explore possible proximity effects on the topological surface state. Many recent results published in the literature deal with the Fe+ Bi2Se3 system. 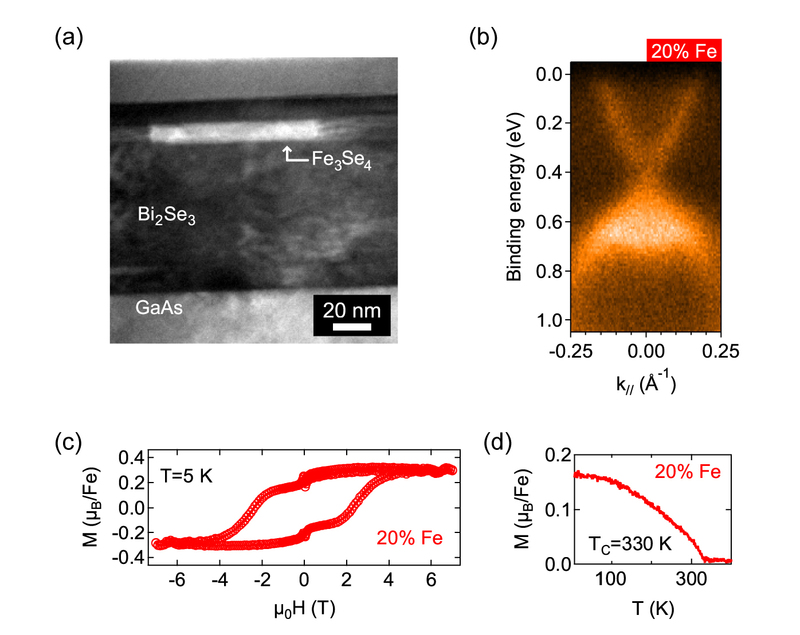 Researchers from the “Growth and properties of hybrid thin films” group have studied this system and demonstrated that Fe incorporation into Bi2Se3 leads, in the optimal growth parameters window for Bi2Se3, to the formation of a nanocomposite. This nanocomposite is obtained by incorporating Fe atoms (up to 20%) in a TI thin film during the growth by molecular beam epitaxy. Fe3Se4 platelets form within the Bi2Se3 film [Fig. (a), electron microscopy image with chemical contrast]. The composite structure has also been confirmed by Rutherford backscattering . The formation of Fe3Se4 has been demonstrated by x-ray diffraction allowing us to evidence the monoclinic structure of this compound. The topological state of Bi2Se3 is preserved, even at 20% Fe content. The persistence of the Dirac cone at the surface of the Fe3Se4:Bi2Se3 system has been verified by angle-resolved photoemission spectroscopy [Fig. b]. The peculiar magnetic properties (hard ferromagnetic with Curie temperature above room temperature) of Fe3Se4 are also preserved within the nanocomposite with a coercive field of µ0Hc=2.5 T at low temperature [fig. (c) and (d)] and a remnant magnetization at room temperature. (a) Image of a nanocomposite Fe3Se4:Bi2Se3/GaAs(111)thin film in cross section (energy loss 60 eV). The light zone is Fe rich. (b) Dirac cone at the Γ point of the first Brillouin zone measured by angle-resolved photoemission spectroscopy. (c) Magnetic hysteresis cycle obtained at 5 K for a Fe3Se4:Bi2Se3/GaAs(111) film containing 20% Fe. (d) Remnant magnetization as a function of the temperature. The control of the size and distribution of the platelets remains a challenge. Nevertheless these results indicate paths towards the growth of nanocomposites coupling TIs and compounds with a collective magnetic order. Such systems may be of interest for fundamental studies on proximity effects where a material in contact with the topological insulator induces the emergence of a new property at the interface.